Unit mass is 2-body system's reduced mass m.
Unit length is the position of the minimum of the effective potential energy in the attractive case (i.e., the radius of the circular orbit): r0 = L2/m|k|. In these unit we have m = L = |k| = 1, the orbit equation is 1/r = ε cos(φ-φ0) + η with η = |k|/k. The eccentricity is ε = (1+2E)1/2, the effective potential energy -η/r+1/2r2 and its minimum is at point (1,-1/2) for attractive forces. If Orbit is selected, along with the orbit one can see the conserved Laplace-Runge-Lenz vector, which goes through the pericentron. To get information on one element, put over it the mouse pointer to see the corresponding tooltip. On the left one can see the effective potential energy corresponding to the equivalent one-dimensional problem (in red). Use the mouse (or the corresponding numerical entries) to change the mechanical energy E and the initial value of the polar distance r: the polar angle φ (phi in the simulation) will be set automatically. Discuss the values of the eccentricity ε (e) and the form of the orbit for different values of E.
Uncheck Attracting and discuss what happens with repulsive forces. Change orbit's spatial orientation by choosing the pericentron position φ0 (called per in the simulation) or use the following procedure. The plane relative motion is displayed on the right. 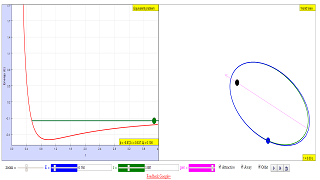 Use the mouse to select the initial position and the orbit orientation. With the simultaneous evolutions in the double display you can check that the return points of the one-dimensional problem correspond in the full problem to apses, where the velocity does not vanish, but is perpendicular to the radius. This is an English translation of the Basque original for a course on mechanics, oscillations and waves. It requires Java 1.5 or newer and was created by Juan M. Aguirregabiria with Easy Java Simulations (Ejs) by Francisco Esquembre. I thank Wolfgang Christian and Francisco Esquembre for their help. derive, from Newton’s law of gravitation and the definition of gravitational field strength, the equation g=GMr2for the gravitational field strength of a point mass. recall and apply the equation g=GMr2 for the gravitational field strength of a point mass to new situations or to solve related problems. solve problems using the equationϕ=-GMrfor the gravitational potential in the field of a point mass.